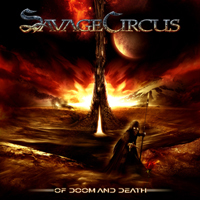 4 years ago "Savage Circus" delivered to us the majestic "Dreamland Manor". And now we have the even better follow up "Of Doom & Death"....Now if you are looking for originality or something new, stop reading now..... If I didn't have the fact sheets and was listening to this album for the first time I swear it would be Blind Guardian. But then I hear little bits of Iron Savior coming thru as well, thanks mainly to Piet Sielck. Onto the music, to my ears this is what would happen if "Blind Guardian & Iron Savior" merged into one band. That band would be Savage Circus!!!!!! Form the opening track "Of Doom & Death" you know this is going to be a great album (If you can get past the BG influence) full of melodies, harmonies and great vocals. This is power metal at it's best. But one would expect that with the caliber of talent on "Of Doom & Death" Jens Karlsson (vocals; Persuader), Emil Norberg (lead guitar; Persuader), Piet Sielck (guitar, bass, backing vocals; Iron Savior) and Mike Terrana (drums; Axel Rudi Pell, Rage, Yngwie J. Malmsteen, Masterplan). Bottom Line... To tell you the truth, I love this album and will probably be my top pick for 2009 for Power Metal. But I can see why some people won’t like it as well. Best thing Blind Guardian as done in 10 years ...Are you listening Hansi!! !